Megaball is eight-games-in-one where each game is a different betting strategy. Every minute six balls are drawn to determine the winning combinations. You can play one betting strategy or up to 10 at a time. On the left of the game screen a choice of eight games is available — each game offers a different betting strategy. Click any of them then follow the displayed instructions. Each game offers you the choice to play for one drawing or multiple drawings (up to 50 repetitions). A table displays your active bets in the center of the screen. After you have submitted all of your bets, you can click on each bet in the table to modify or delete it. A clock displaying the time remaining until the start of the next draw is displayed at the top of the screen. During the last 10 seconds of the countdown, you cannot place a bet (the Confirm button will no longer be displayed). Wait until the Confirm button appears then you can place a bet for the next drawing. A percentage of every bet you make goes into the progressive jackpot pool. The current size of the jackpot is displayed at the top of the screen. 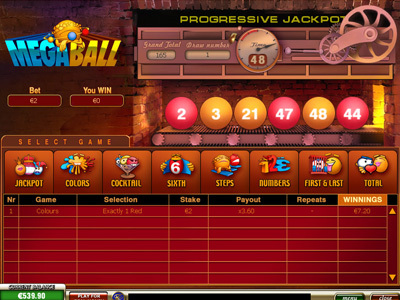 To win the Jackpot, you must select the “JACKPOT” game and correctly guess the five balls.